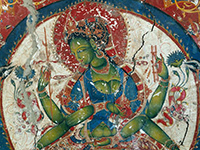 Professor Emeritus of Technical University Cologne, Dr. Jaroslav Poncar looks back upon nearly four decades of photographically documenting Buddhist monuments in the Himalayan regionnotably Alchi in Ladakh, Tabo in Spiti, and Mustang in Nepaland at Angkor Wat and elsewhere in Southern Asia. In this talk Dr. Poncar will reflect on his rich oeuvre, discuss the challenges of photographing particular sites and the technical solutions adopted, and also ponders on the ways in which digital photography has impacted this work. Born in Prague in 1945, Jaroslav Poncar has lived in Cologne since 1973, where he served as professor in the Department of Imaging Sciences, Technical University, Cologne. Besides Africa and Arabia, his photographic projects have taken him to Southern and Central Asia, especially to the Western Himalayas, Tibet, India, Burma, Cambodia and Afghanistan. Between 1996 and 2005 he was in charge of the photographic documentation of Angkor Wat and served as co-director of the German Apsara Conservation Project at Angkor Wat. After his retirement in July 2010 he was contracted for a year to photographically document the cultural heritage of Afghanistan, and since 2015 he has been part of a project documenting the manuscripts and material culture of monasteries in the Tibetan kingdom of Mustang in Nepal.